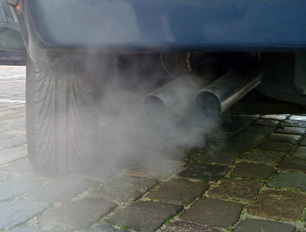 Benzene exposure is common through car exhaust. Benzene is a highly flammable volatile organic compound used in the manufacture of plastics, rubber, resins, synthetic fabrics, paints and dry cleaning chemicals. It can also be found in car exhaust or cigarette smoke, or it can form naturally, in volcanoes, forest fires and crude oil. Benzene is added to gasoline to increase octane. Automobile emissions are the main source of benzene in the environment, but it is more likely to arrive in water by way of industrial discharge or landfill leaching. Benzene is toxic in small doses. According to the EPA, acute benzene exposure above the maximum contaminant level (0.005 milligrams per Liter) can cause “temporary nervous system disorders, immune system depression [and] anemia.” It's also a carcinogen, and can lead to chromosome abnormalities with long-term exposure. Acute exposure of humans to high concentrations of benzene primarily affects the central nervous system. At lower concentrations, benzene is toxic to the haematopoietic system, causing a continuum of haematological changes, including leukaemia. The EPA and WHO recommend granular carbon and air stripping. According to Lenntech, activated carbon alone has a “high probability” of adsorbing benzene.